1. Heat oven to 325 degrees. Fill a kettle with water and place over high heat to bring to a boil. In a large mixing bowl, combine cream, milk, 1 1/2 cups sugar, eggs, egg yolks and vanilla. Whisk to blend. 2. 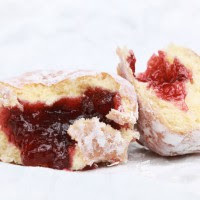 Using a serrated knife, gently slice doughnuts from top to bottom in 1/4-inch slices. Butter a 9-by-12-inch baking pan and sprinkle with 1 tablespoon sugar. Pour about 1/2 inch of the cream mixture into pan. Arrange a layer of sliced doughnuts in pan, overlapping them slightly. Top with another layer, pressing them down slightly to moisten them. Top with a small amount of cream mixture. 3. Arrange 2 more layers of sliced doughnuts, and pour remaining liquid evenly over top. Press down gently to moisten. Sprinkle with remaining 1 tablespoon sugar. Cover pan tightly with foil, and place in a larger pan. Fill larger pan with boiling water until three-quarters up the side ofpan. 4. Bake for 1 hour 50 minutes. Remove foil and continue to bake until top is golden brown, about 15 minutes. Turn off oven, open door slightly, and leave in oven for an additional 10 minutes. Serve warm or at room temperature.